Last night I shared that we put a new roof on our home and received heartfelt criticism for not being sensitive during hard times. There are people who need work. Those of us who still have it should push ourselves not to hoard. If you need a professional home repair, now is a great time to schedule it. Why would someone criticize you for a new roof? That hardly seems extravagant, especially if it's a leaky or damaged roof, lol! And anyone who knows you or reads your blog would know you make financial decisions carefully. My head exploded at the thought that someone else believes they have a right to make your decisions for you, because it wasn't "sensitive" to THEIR situation? I saw the original post last night; while I have no current need for a new roof and no funds for one if I did, I certainly don't begrudge your family's decision and abilities. Meredith, This hit home for me because I have felt a little sheepish spending money at this time because others don't have it. The truth is, my husband and I scrimped and saved when everyone else was spending lavishly! Anyway, we are getting ready to redo our kitchen and I'm sure the cabinet man, counter top company and painter will appreciate the job (small as it is)! Funny how those who accuse others of being insensitive don't see how their attitudes could be construed as insensitive themselves. If you need a new roof and have the money (because you are frugal and plan ahead for emergencies) then maybe those people should learn something from your example instead of complaining. Hubby and I were just talking about this last night. We have some home improvement projects we would like to get done, and, like you, we have been careful with our budget all along, so we have the funds to do so. The whole point of the "stimulus package" was to funnel more money into the economy, right? What better way than for those of us who have money, to funnel it into the economy by purchasing SERVICES--not just cheap junk from Wal-Mart, thereby creating job security for those workers? I think your timing could not have been better. Oh, and the roof looks great! We need a new roof too, and hope to get it done over the summer. Everyone we have contacted for estimates was just fine with the idea of us spending our money. I was very sensitive and careful when I posted about our recent Hawaii vacation, trying to explain that we saved up carefully and thoughtfully. It's tough- I'm sorry you received criticism! A roof seems like a sensible thing to spend money on, really. You make a good point about helping others get work by employing them to help you with something you need anyway. I'm with fmrduranie2001 on this....criticizing you for a new roof? We need to have some siding replaced on our home. We have it scheduled for this spring. Home maintenance is still a necessity in the midst of this difficult economy. This is why homeowners need to have a savings account/emergency fund. It seems like an investment to me, putting on a new roof. And a savings plan as well. What if you had to pay for costly interior repairs due to water damage? Surely then you'd be kicking yourselves for not replacing when you could have. Furthermore, I think it's rude for people to assume the position that just because they can't afford something that no one else should have it either. "If you need a new roof and have the money (because you are frugal and plan ahead for emergencies) then maybe those people should learn something from your example instead of complaining." Kathleen hit the nail squarely on the head. Also, if anything is "insensitive" to the financial need of others, it's hoarding when you have an opportunity to help others. Contractors, builders, and people working in other aspects of the home building/home improvement industry are in a very rough spot right now. I think that by recognizing that and choosing to hire a roofer instead of doing a DIY patch job, you've been compassionate to their situation. Not to mention the fact that a new roof is a sound financial move for your family at this time. If you'd boasted about buying a new luxury SUV, the criticizers might have had a point. Posting about now being a good time to hire a home improvement professional is not quite the same thing. 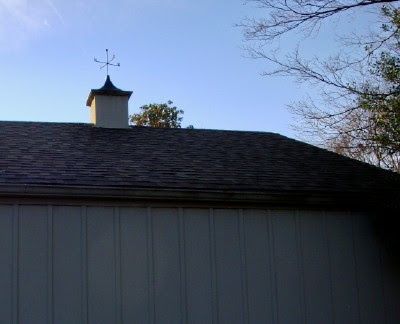 A roof is a worthy investment of your time. I'm sorry that you got criticism. I think your new roof is beautiful, and I'm sure that your roofer was happy to have the job. Unbelievable. Everyone else has already posted what I'm thinking. Will it soon be "insensitive" to post recipes because food and eating are extravagant? People are jerks. Everyone else has already said what I would have so just count this as my "hear, hear!" I saw your post on my Google reader last night and thought it was commendable of you to recognize the difference between frugality and miserliness! And shame on anyone who criticized you for that post. We should all be encouraging others, particularly those of us who still have employment, to try and employ those who are between jobs. I think the issue was NOT that we re-roofed, but that I wrote about it on the blog. To some, that may have seemed like bragging or as the original commenter wrote, "rubbing salt in the wounds." That made me feel terrible, because that's the last thing I would want to do. The truth is, my husband has doubled his income since I began writing this blog. I am not going to apologize for how hard he works or how hard we have worked as a family to pay cash for his graduate training. We are still driving a 17-year-old car, for goodness' sake! I can understand I had bought a new car or a fur coat, but criticism of a new roof caught me off guard. I shared because I think it's a timely topic for these hard times. What do you do when you have put money aside for repairs? Are you spending it now, or saving it as a hedge against job loss? Meredith, whoever criticized you has some jealousy issues with you, count on it. About all you can do is pray for them, and pray that you don't take it too much to heart. People are unbelieveable. It's amazing how people will find anything to critcize. If no on spends money then our economy WILL go under. You not only supported the roofer but also the seller of the equipment, the gas station where the roofer needed to fill up to get to your house, the lunch place he bought lunch (if he didn't bring it) and so on. We are putting in a new bathroom (not really by choice as ours is causing damage to the kitchen below) but I don't feel at all guilty. I hired my brother who recently lost a job and trust me, he is not offended by it. I think it's great that you had the funds to provide your family with a new roof and someone else with a paycheck in the process. Now to flaunt a brand new Prada bag or a Mercedes... that's a different story. I guess the person who critized you never stopped to think about the fact that the construction industry is in a serious downturn. That roofer was probably very happy to have your work. On the same vein my parents are building a new house, they have hired a sub-contractor from our church who has five kids and was just laid off. My parents are "standing in the gap" for him. Good for you, your prudence is paying off. Why would someone criticize you for putting a new roof on your home? Isn't the whole point of being frugal and saving money to keep a "roof over our head" among other thing. That is not an extravegance, that is a necessity. Not to mention a Mitzva (BLESSING) for giving people work at a time when work is scarce! I'm in accordance with you. Today I am getting 21 new windows in my home. They will save on energy costs, provide work for 4 men, and take advantage of Energy star money available from the stimulus package. That just burns my taters! You and I are a lot alike in the fact that we both are frugal people, and have been for years. Like your husband's, my husband's income has also doubled, as well as a significant increase in my own income in the last two years (almost doubled as well). We worked HARD to get those increases. We chose jobs that were not "out-sourceable," ones that were consumer driven (and even in tough times people do NOT give up). I am not saying that we made better choices, but we thought hard about them when the economy was in good shape. Now that we have so few payments that we can enjoy using the money that we have earned, I am actually getting tired of hiding it. I am appalled that someone thought you -- OF ALL PEOPLE -- could be insensitive. You are one of the most sensitive, lovely, and hospitiable people I know. That person was probably one of the same people who even three years ago would have overlooked the idea of being frugal, when they were living the high life. Those of us who have been frugal for years and years are now seen as the "wise ones." We were seen as odd and cheap a few years ago. Funny how that changes when the majority are now trying to learn how to save money. Since there are so many stores (and even contractors) competing to stay alive right now, there are so many great deals to be had. I hate that it has to be due to an economic crisis, but any frugal person has to be happy about the rock-bottom sale prices on larger items. I would bet this week's paycheck that you probably paid cash to have your roof done. I say if you can ACTUALLY afford it, then go for it! I promise I will not be one bit upset that my neighbors cannot afford to go to the beach this summer while I am sitting in the sand and sun. There have been years when we couldn't afford it, but now we can -- so we are going to JOYFULLY live a little. Much love and many hugs to you, my sweet friend! Do not apologize for God's blessings and favor toward your family. God will continue to bless you doublely, because with that new roof, you have allowed a couple of families to make it over the next few months as a result. Construction and maintenance industries are suffering and now is a good time to hand pick who you want to do complete the work for you. It should inspire 'nay sayers' to want to do better in the own lives - to be happy for others' blessings - because that's exactly when you know that God is just that closer to sending 'your' blessing. It's a testimony - Plain and simple - I say, keep them coming. I can't believe someone would criticize you for that. We live in an older home that needs LOTS of repairs. Beyond what my husband and I can do ourselves. I can't see how getting needed repairs to a home would be bragging in any form or fashion. As the daughter of a carpenter, I can tell you for certain my Daddy was thankful for the work he got especially during the slow times. Some people - they just want to steal your joy because unfortunately they have none of their own. I am shocked that someone criticized your decision to get a new roof. Everyone's situation is different. You gave someone work. You made a necessary repair to your home. Perhaps everyone can learn from the value of being frugal in times of plenty for just this reason - to have money when you need it. How sad that someone took such offense at you telling the truth--you saved, and you had enough money to repair your house. Praise God that you have the resources to take care of your family and the possessions He has given you. I'm with the rest of the folks who've commented - but I think Gina says it best - "that just burns my taters!" The fact that you blogged about it is, in my mind, proof positive that your family has done what you need to do to put yourselves in a position to be able to do what you need to do. And as for your comment about "if I'd bought a new car".... after saying your car is 17 years old? Well by golly, I say if you all wanna go buy a new car AND you wanna blog about it - GO FOR IT. :-P I think you'll be pleasantly surprised that many of your readers will be thrilled for you. And we'll run the bad apples outta town while we're doing the happy dance for your blessing - new roof, new car, WHATever. Now is the time for home repair: interest rates are low, can get a tax break, and you're helping to stimulate the economy by continuing with your life. Good for you! Btw: you're a KreativBlogger too! Ditto to what everyone else has said. I have to admit that I re-read your post because I was sure I'd misread it...I mean, who would CRITICIZE you for getting a new roof? We just had some roof work done ourselves, by an out-of-work construction worker we'd found on Craigslist. He was THRILLED to have the job and we were equally thrilled with the more-than-fair price he charged! So were those same people watching their dollars when you had tough times? I really don't see what one has to do with the other. Aren't we supposed to spend to help the economy? Too bad they didn't plan better. It is your blog, you can blog about anything you see fit, and if others consider it salt, then they simply do not know your heart. I for one think you set a lovely example on how to live, and how to spend. Meredith, haven't been online for days, so I missed the post you were criticized for. But I can guess what was said! Just this week I was talking with a friend who is a self-employed carpenter, he has had no jobs for a while and was marketing himself to us and others. My husband can't build anything to save his life, but what he DOES provides a good living for us, with surplus. It is WISE to pay for others' skills where we are weak, and keep the economy rolling along. Counterproductive to wallow in jealousy! Besides, one day it could be us needing the work. As hubs often says when OUR business is slow: "some pie is better than no pie", and I can assure you, my carpenter friend would rather be repairing someone's back steps than sitting around wishing he was building the whole porch. p.s., this is a GREAT time to get bargains on labor, the highest percentage cost of any job. i never did see the post you are refering too, but i cannot imagine you were bragging about it..you have too much grace for that..
anyhow..you know meredith..a few rotten apples and all that..
That's so sad. I like the "burns my taters" comment--mine too! I think people just like to find something to criticize. One time I received a HUGE financial blessing at a time I had nothing and some people were very rude to me about it. I was stunned. I had nothing to pay my bills, no way to care for my son and I had prayed and prayed for God to show me what to do and this blessing arrived. To say I was stunned at the words I heard is an understatement. We just had our carpets cleaned and stretched by ProCare in Nashville and are so happy with the results! We found them to be very attentive and dedicated to the job, likely partially a symptom of business being slow. I totally agree, Meredith. This is exactly what we should be doing right now...making wise money decisions and supporting our hardworking neighbors. Blogging about it was an excellent reminder for the rest of us! I think sometimes people who are hurting are looking for someone to take it out on. I'm sorry that was you. Reading your blog all this time, I don't think I can remember a time that you have EVER been insensitive. The older I get, the more I honestly believe: some people believe happiness is FINITE, and if someone else has it, then there is Less to go around. Therefore they begrudge you yours'. When will they realize happiness is INFINITE! If you have it that just AFFIRMS it is there for everyone! I think it should give people HOPE. Thank you for this post. My business relies on folks investing money into their homes to make them more energy efficient. Many improvements made to your home could equal savings and can add value at resale time. There are some amazing grants, state tax incentives, and federal tax credits now available for qualified repairs and upgrades. Your new roof may qualify for some. I'm almost regretting having posted initially, because I'm sure you didn't want this to turn into something that makes the commenter in question feel bad. Especially because as you said, the comment made you feel terrible. If my husband were to lose his job, we would not be getting our own roof done, even though that is what the money has been set aside for. We have worked hard to set that money aside, but we have also been very blessed to be able to do so, and I can't take those blessings lightly. So I can't really point fingers and say "if they don't have money it's because I'm better than them" (which isn't what you're doing of course) because I am very lucky that my family is in the position it is. wow - I am so sorry that you were criticized. I couldn't believe it. That brought up a lot of emotion in me, when I read that you were criticized. My husband and I have always been careful with money but even now with the economy the way it is, we're able to do some stuff that others can't because of the choices we made 10 years ago. I'm thankful that you were able to fix the roof - I'm sure the people who did it were thankful for the job! Thank you!!! My husband is a Ceramic Tile Contractor. There is NOTHING wrong with doing things to/for your house if you have the money to do it. If EVERYONE stopped doing maintenance and re-models there would be a ton of families in worse shape! I agree with the othrs here, if you had the money and found a good deal, go for it no matter if it was a new roof or a new car or whatever. It's your money and you are the best ones to decide how to spend it. Last winter we had a really bad ice storm and it caused damage to our roof. The insurance company came out and told us we needed a new one so we started calling around. We live in NH and the temps were in the minus numbers so I didn't even think that we could get a roof on but the roofers we talked to all told us that when the temps hit 33 degrees they would be on the roof. We got a new roof in January on the only 2 days the entire month that it hit 33 degrees. And we were criticized for it for "times were hard"! I told one woman - "We have NO ROOF!!! We are going to get one as soon as possible and that is all there is to it" Still some people didn't understand. Hay, get what you can. Prices are really good and companies are so very happy with the work. Ugh...some people will take every opportunity to be judge. If everyone budgeted like you do, as well as paid for things when they could afford it instead of just because they wanted it, maybe the world would be better off financially. I find the fact that you actually blogged about it to be just another wonderful testimony to what you are sharing and teaching on this blog. So, for someone to think it insensitive...is absurd. I guess if I was having a hard time finding a flower girl/baptismal dress, I should of called you on your insensitivity for posting about the beautiful (and creative) find you recently made. lol. Makes no sense. It is people like us, who have lived frugally and who are possibly able to weather this 'financial crisis' a little easier, that will also be the ones to help get it back on its feet. I am sure that you didn't replace your roof just for fun. I am sure it needed it and you saved up the money for it and then you got it done. How can that ever be construed as insensitive to other people is beyond me. Whoever criticized you has some issues that really have nothing to do with you Meredith. We are replacing our roof in May, it desparately needs it and is leaking all over. In fact because we waited to save the cash for it, the repairs will be more than if we had done it a year ago, because now the ceiling in our garage is caving in because of the water damage. Yikes! We have saved hard and will do it ourself. But There are companies out there that will benefit from us replacing the roof (roof supply company, dumpster company, etc). Unbelievable that someone criticized you. Way to go paying cash for such a huge necessity! I recently needed my garage cleaned out. I had several things that needed to be taken to the dump and didn't have the time or resources to haul it away to the places they needed to go. I searched craigslist and was overwhelmed by the number of people in my small area alone who were looking fr work to make ends meet. I was happy to call someone up with a truck and pay him to do it. Normally I don't have a few extra hundred dollars around for this- but right now I do. I was grateful and the man who did it was grateful also. He was using my extra cash to put food on the table. I am planning on finding some people to help me with spring yard clean up as well. I will repeat what I posted last nite to your original roofing post: great stimulus spending!! What our economy needs is for more people to spend wisely and reroofing to protect the investment on your house is a wise spend. And the various ways your money is now trickling thru the local economy is, in my opinion, far more valuable than "someday" fed govt spending! Kudos to having the wisdom to save for expenses like these!! And enjoy that new roof! I'm sure the contractor enjoyed installing it! Besides the fact that the last time I checked it's still a free country and we don't have to have Anyone's approval how or when we spend it. Silly Socialist thoughts people are having! For Pete's sake! Who would do that? I'm really sorry. You should have left the original post up. Whoever criticized you shouldn't have the power of making you change your blog. I'm proud of you, and I think it's great that you can afford to stimulate the economy when it needs it! Oh, my good Lord! People really need a chill pill. By getting the roof you protected your family from the elements, protected your investment in your home and provided some "economic stimulus" to the roofers, the roofing company, the suppliers to the roofing company and on and on it goes!!! God Bless You and God Bless the complainers also. I guess I had really better not share on my own blog about how my husband and I are taking a trip to England to celebrate our 10th anniversary. Never mind that we've been saving for this trip for OVER 5 years, are paying cash, and live super frugally the rest of the time. I cannot believe the audacity of some people! OK, I can believe it but it still makes me crazy. Meredith, I never comment on your blog, but I enjoy it immensely precisely because its spirit is exactly the opposite of the commenter's. I was very proud of you when I read about your new roof, and it reminded me of why I think you are so sensible. So many frugal tips are "penny wise, pound foolish" and I never find that thinking here. Beside the fact that it makes sense financially, you are doing a service to your community. I myself have just contracted to do 3 projects I have been putting off, because I know the jobs will help the attic insulation guy, the window guy, and the plumber as much as having those projects done will benefit me and my utility bills. I hate to pile on, but I have heard enough finger pointing and judgment in these difficult times. Even if we are strapped financially, we can all afford kindness and compassion. I'm really concerned about the type of people that we're becoming. Are there no consequences for making bad decisions? Are we turning into a nation of beggars, all waiting for our share of the stimulus money? Why in the world would anyone begrudge you a new roof? It's bad manners and just plain whiny to criticize someone for making a needed household change. The correct response, in my book, is, "Good for you! I hope it lasts for years and years!" I see a new roof repair much closer on the side of a "need" versus a "want." I did get to read the initial post and the negative comment. The initial post, as I remember it, did make it sound like a complete layer of shingles instead of a patch was a choice that could be made based on having the money set aside and that many companies were willing, able, and needing to do the work at this time with the economy. I didn't see anything negative or hurtful in the post. I do think it was a timely post adressing the continued theme of the blog about making choices with money. I did get to read the critical comment, and I do not know the commenter. It seemed to be a knee jerk reaction by someone who is likely desperatly hurting in these times. Not everyone is hurting because of lavish spending in the past. Healthcare emergencies are the number one reason for bankruptcy in this country. I have a friend who is hurting right now. She has never overspent and her wants have always been simple things. Her only fault was choosing to marry the wrong person. She works full time plus extra on the side. But as a single mom, when her ex husband lost his job the child support was gone. He's not in a hurry to get a new job. She is scared and hurting. I've heard her make comments out of fear and pain. But she is a very kind and giving person. She is just desperate and terrified. Just as many have made quick responses in defense to Merideth, I think the negative response was a quick response by someone who clearly said she was open wounds and is hurting. I want to support and thank Merideth for this blog. For the information, her time, effort and today for her thick skin. You have done this for so long, you must have developed a thick skin. I also choose to support her without attacking someone else who is hurting. This is what is wrong with our Country, if someone feels uncomfortable or they feel you are not being sensitive they get bent out of shape. . .why do we allow people to do this?! No offense, but this is how our country has turned so "PC." We can not let others do this to us. We bought a home the non-traditional way so we don't need your money to bail us out of a poor decision. We are wise with our money and we have not always been!! Regardless we live the lifestyle we have now because we chose not to live like everyone else. We are about to undergo renovations on our house, we are doing the work ourselves but we are helping the economy by buying the supplies we need. I am sensitive, my mom lost her job she worked for a major bank. . .but my life will continue to go on, I'm not hoarding my money. Things are going to get worse, MUCH worse, but I wont live in fear that someone who was not wise with their money will become upset. Ok, I was going to post a big huge stinking comment in your defense, but I do believe everyone else has done it for me. I'm so sorry for the hurt you must have felt. Even though from a stranger, it cuts deep. We love you and know your heart!!!! I think you were very wise to have this done during a downturn in the economy...just like the Proverbs 31 woman, you considered a new ROOF and bought it...you extended your hands to the needy (contractors are surely in need of work during times like these)...and you most certainly watch over the affairs of your household, waiting for just the right time to have such work done so that you paid a sensible price for it. This was most certainly a wise purchase for your family, and actually spawned a conversation with my husband last night that has led to our looking to hire someone to come in and finish up our trim work from our recent renovation as a means of helping out others who are struggling to find enough work to keep their families fed instead of limping along trying to do it all on our own. If you've got a need, and others have needs, and you've got the money to help both...that just makes good sense. That's the beauty of capitalism and free enterprise, and supporting our local economies. Who knows but that hiring that contractor didn't just prevent one more family from losing their home for a time? Your last post also served as a reminder to pick up sale items for our church food pantry while grocery shopping. A little bit here and there out of our food budget is one way we can help other folks who are struggling to make ends meet during these tough times, and not just around the Holidays. Our local economy really took a hit with the building boom drying up and all the folks in construction now without work. This would indeed be a very good time to hire out work that needs to be done. An underlying attitude that I picked up from the post last night was that those with higher incomes (whatever “higher” may be) don’t have any business being frugal - that if you make $X a year, who are you to pinch pennies?! What a dangerous way of thinking!! Frugality is the careful management of resources, which is something that people in every income level ought to practice. Discontent can exist with any income; in fact, it may become even worse as income rises and choices become broader. With undisciplined spending habits and attitudes, more will never be enough. Conversely, contentment paired with frugal practices create a feeling of abundance which keeps us afloat during lean times, and frees us to do the most generous and responsible things during prosperous times. Be encouraged, Meredith! Your advice is not hollow. It is packed to the brim with rich substance! As the wife of a contractor whose business is slow right now...if not downright scary...I thank you for utilizing the building industry during these hard times. It's people like you and your husband that people like my husband and I are counting on right now. There is no need to apologize for being able to do what needs to be done...you are ALWAYS careful with your resources...you do not squander them away...you buy used and on sale and save wherever you can. This is the very reason you were able to replace your roof. We replaced our roof last year around this time and it felt SO GOOD. It was in need of replacing for years...it leaked...it was TIME. I was thankful to God for the means to get it done. No worries girlfriend...you do a great job! Just to clarify - I was referring to the COMMENT about the original post, not Meredith's post. As someone whose spouse is in the construction business, and who knows several other families who are as well, I fully agree with you. People in this industry are really hurting for work. If you need a repair and can afford to pay, you are doing a lot of people a favor by hiring them, and blessing a lot of families. Persons reading who are in financial distress would perhaps be better served to be inspired by how you have managed and keep reading to learn how, rather than complain that they are unable to do the same. You make a good case for careful management of resources. Just to clarify - I was referring to the COMMENT on the original post, not Meredith's post. Please don't start worrying about editing out what you do spend money on--I am interested and love that you share what you're doing, even if for whatever reason I cannot do it myself. You are a lovely person and it should make everyone else happy when you have nice things and life goes well for you. I, for one, find good and happy things encouraging even if my only involvement is reading about them! Add my taters to the burned list. You guys worked hard for that cash, and shouldn't have to answer for literally putting a roof over your heads. Re: the repairs - our landlord takes care of them (well, when he's so inclined), so we're putting the banked cash towards a wedding (with lots of local vendors, hopefully). Don't feel sheepish about spending money.... that's what drives and fuels the economy to get better. The Farmer is still working - for a large fresh herb operation. We have hired our out of work neighbors - an electrician and a plumber - to do some work we're been putting off. This is the way we help our neighbors in time of need, with some work that they sorely need. We've been in this situation ourselves. Without a roof you're home will be ruined. It's not like you purchased a luxury yacht!!! Like I said, you fueled the economy and the worst thing anyone can do is panic. It's a free country. If you want to re-do your roof, it's your own business. I like to be sensitive to other people, but nobody is going to dictate to me when to use my own common sense regardless of what the neighbors (or anyone on cyberspace) may think or say. thank you for your wise and wonderful posts that are helping me be more frugal and thus more able to not only take care of needs but also bless others. Thank you for giving the roofers some honest work and income! I read your original post and I can't see why anyone could find cause to complain. Ridiculous. Okay, this actually just made me laugh. Seriously. I've never known anyone to buy a new roof as a frivolous expense, so I seriously don't understand how anyone could have criticized you for posting about yours! I realize that there are people out there who are hurting from the state of the economy right now, but that doesn't mean that everyone else has to stick their heads in the sand and pretend that we aren't spending money on anything right now to make them feel better. If you were purchasing unnecessary luxury items and flaunting them here, I could maybe understand the criticism, but a new roof?! Hardly a frivolous item! And I agree that you're helping a local company by hiring them! Guess I shouldn't have posted on my blog about the great clothing deals I'm finding out there with all the stores desperate to move merchandise. We have a clothing budget, so I used the money from it. I guess that's one of the good things about having a small blog--I don't tend to be criticized by readers because I don't have very many! LOL. Chin up. You're doing a great job, as always. I love to read about how your family uses its resources responsibly. Those types of comments are completely irrational. You needed a home repair that was a necessity not a luxury. Postponing expenses like that is hat I actually consider being cheap not frugal. Fixing your problem with the resources that you had is the responsible thing to do. Ignoring necessary repairs because the economy is soft even though you have the resources to pay for them is irrational and ultimately expensive. Meredith, as always you show that you are a class act. You could have blasted the person who wrote the tackless comment. I did read it this morning and I thought WOW, she just does not get it. I am a lot older than you. I have seen good times and bad times. The times now are rough for some people. We recently went through a job loss in our family. My husband lost his job and was out of work for 3 months. He and I were lucky that we had a few dollars in the bank and he used the time off to get some much needed home repairs done. I was so glad that he was home to see to it that when the new doors were installed they were done right. We are blessed that we have lived a frugal life for years and when the down turn came along we were able to bounce back. Not saying it has been easy. It has not, the job my husband took pays a lot less than the one he lost. Lucky we are not used to living on the 'big money' we had, so now we are still okay. Yes, our savings is not growing as fast as it was, but that is okay. We are living within our means. Our president has asked us to spend money if we can. It supports a lot of people when we do. I for one will be doing some more spending in the future for some more yard work. This winter I spent more than $1,500.00 to have 2 trees cut down and taken off. My husband is a stroke victim and I did not want him doing it. So I hired it done. It was great for the local landscape company to get the business...see what goes around comes around. Our "to improve" list is long on this 1916 house. Blessedly, we count ourselves among the lucky ones who saved even when times are good. Lived on one income even when we had two. Now we can bless others with much needed jobs. At the top of our list? Guttering and new drywall for a rotted out enclosed porch. Hardly extravagant. I'm thankful the money is there for us, and I'm thankful it was there for you! Pure jealousy. There really is no other explanation for it. This could not have been a regular reader because we all see how hard you work to be frugal....so that you CAN afford the important things. Good for you for doing what you wanted/needed to do for your family. And good for you for blogging about it. Isn't that what our blogs are for? Talking about our lives, our choices -our thoughts... it seems rather insensitive to criticize someone elses personal choices...aren't we all friends here? I guess some took it as "take advantage of the poor economy to get work done cheap." When what you probably meant was, "help stimulate the economy by investing in local contractors and finish some projects." Like some other commentors, we have been saving and trying to live frugally for years now. The benefit of that lifestyle is hopefully you can afford to maintain your home and other investments because you don't spend money on frivolous things. Not to mention it helps you weather the storms of a bad economy. My carpet is almost 17 years old and it is nasty! I have been waiting for the past five years to replace it. We could have replaced it years ago (and charged it) but we decided to wait till we had the cash. I am still waiting, but if the cash comes in tomorrow, I would not think twice about replacing it. Funny how it's ok to keep up with the Joneses, but when times are tough, are we supposed to suffer along with them? None of it makes sense. I'm glad you were able to get a new roof, and I'm certain the laborers were thrilled to have work! I am so glad you had the money to spend on your roof, but for a completely different reason. My 55 year old brother lost the job he had for over 30 years when the only factory in his small town closed without warning. He lost his retirement, and, at his age, was considered too old to hire by every place he applied. Trying to swim before he sank too deep, he and a friend started doing the only thing they knew how to do: home repair and maintenance. They are both very experienced, having been homeowners and done tons of work on their homes over the years. They charge a fair price and do good work. They have more work than they can do. They often hire a couple of my nephews to help them. They have been hired to do everything from roofing to insulation to building additions and barns and fences. People DO have money to spend, even in the bad economy, they are just very careful spending it right now. All this just to say thank you, on behalf of the contractor you paid to do this work. You, along with others like you, who are careful with the money you have and are not afraid to spend it on quality work, are stimulating the economy in a very practical way. Trillions of tax dollars thrown at useless programs can't change the way people think about their own money. Some people will think they are "owed" a lifestyle they can't afford and will begrudge anyone who has earned that lifestyle. I'm so sorry that you had to endure this unfair criticism. I would have liked, however, for you to have left the original post up because it made a good point about false economy. Don't let idiots bully you. I didn't check out the comments, but I'll bet that when you deleted the whole post because of 1 or more negative comments, you also erased a lot of positive and supportive feedback. Far better, I think, just to moderate comments or delete trollish ones. Congrats on the new roof. A roof certainly isn't a luxury. It's one of the most basic human needs. My husband does home improvements, and if everyone felt that having something done around their house was not in good taste right now, then he would have no work and we no money to live on. And many others like him! And a roof is most definitely not frivolous. Thank you to everyone who can still afford to have remodeling or improvements done, for doing them and keeping those of us in this line of work, from being jobless right now! No problems with you sharing it either! I did delete the original post including about 8 nice comments people took the time to write. The one comment that was critical also included some personal information about my husband's job, which I prefer not to discuss here. Later I realized that I didn't really want to delete the whole post without leaving an explanation. I just don't have time to sit on the computer and moderate comments all day, but I'm leaving things on moderation for now and will publish comments in batches as I am able. I say do what is best for your family. If that means putting on a new roof, do so. I think of this Scripture often: Do not return evil for evil or insult for insult, but rather a blessing...for to this you were called. Being sensitive to the financial situation of those around you? In this type of market, that is best done by spending wisely where you can. Choosing not to spend out of fear or "sensitivity" only makes the financial situation worse! You're absolutely right - people need the work. One of the best ways to spread the wealth these days is to help support the economy by being an active participant. Good for you. And it was a roof, for pete's sake....not a new Mercedes or a tour of Europe. A roof folks! You know...shelter for a family? And as I continued to read some of these comments, I just have to say: its none of our ding-dang business if it is a need or a want. Some people are justifying your decision by saying "oh, you really needed that." I say if you have the money and even if you just want it and you and your husband decide its good, then its good. End of story. Need or want. No one's business. To Meredith: It's pretty much all been said, so I'll just say I echo the support and second the encouragement that spending wisely can be helpful for those from whom you purchase. Unfortunately we are not among those who were frugal all along, having overextended ourselves for dh's dream of big house in 'burbs, but I can see how the current economic situation is not a surprise, and even vindicating, to longtime frugalites, but I very much appreciate that your attitude is always cheerful and encouraging Meredith. As the wife of one of the contractors who is *barely* surviving - SOLELY because of families like yours - I say thank you. We have received similar criticism when we speak in conversation about moving into our "new house". What people fail to realize is that we are moving into this house because we HAVE TO - not because we thought it was a terrific time to build. This is the last house my builder husband built, and it has not sold. We have to move into it and rent ours out, and still we're in danger of loosing both of them. I wish I had read your original post, but I missed it - when I checked my reader this morning, it was there but you'd already taken it down. I applaud you for being thoughtful, intentional and writing from your heart. Thanks for all you do to encourage me! I want to point out that the comment was not aimed at our new roof--but at my lack of sensitivity in posting about the ability to get one at a time when families are struggling to survive, financially. I wish that I had been blogging during our leanest times. I have written here before that we are all just a major illness or unemployment away from losing everything, no matter how hard we work or how much we can squirrel away. Thank you for being such a source of encouragement for me. I hope I can continue to be a source of encouragment to you, as well. I lurk around here on a regular basis but I felt compelled to leave a comment about this post. I shared a similar post on spending money. No one criticized me-probably because I have a grand total of 2-3 people who visit my blog and they are either family or friends! However, I agree with you about helping others. As I type, someone is spreading topsoil in our front yard. Why? Well, because it is a project that we have saved up for and because my husband knew the individual doing the work needed a job. He teaches his daughter and found out that he had been out of work for several weeks. Keep on Keeping On, Meredeth! Thanks to the role modeling I have received here from yourself and many of the other women who comment here, I have changed my spending habits and financial attitudes 360 degrees! As a result we are still able to support our local economy by eating out occasionally-one of my favorite treats! If you had kept your choices under a bushel for fear of offending someone, I might not have learned so much. Interesting. As one whose husband is a house painter, I was glad to see someone employing those in the trades, especially during the slow season. I've always seen a new roof as a necessity. I mean, I've never known anyone to say, "Hey, I really want to make our neighbors burn with jealously at our high-falutin' lifestyle. How best can we do that? A Ferrari? A 3 month tour of Europe? No, no! I have it! A new roof!!!!" You will never make everyone happy, don't even try. You know Meredith, you don't have to justify how you spend the money you've worked hard to earn. Rather, folks be encouraged to see how frugality has enabled you to meet needs for your family, even in hard times? Please don't apologized for being a good steward and for being blessed. Shame on those that criticized you. My husband is one who would benefit from someone building or remodeling. We appreciate all the work that comes along these days. I just found your blog and I am enjoying reading your past posts. So sorry to hear you received anything negative about your roof. Your home is probably your biggest asset. If you have the money to make needed repairs you are not only helping someone else put food on the table, you are making wise choices for your family. PS sorry if someone else already said the same thing, but I didn't have time to read through your 90+ comments :). no criticisms here. i feel so grateful one of us is still employed and am thinking through work we can pay out for to help employ a couple friends with kids who are unemployed and fearing they will lose everything. Chastised?? That's ridiculous! If you have been financially responsible and have saved the money to replace your roof AND got a great deal, then great for you! We are finally able to look for a condo to purchase -- is it wrong that we waited until the prices came down to afford it? I don't think so! The criticism is of course ridiculous. I would caution your readers as well to remember that living within our means and being frugal in order to have the freedom to buy without guilt can also include what some of us may consider luxuries. If you had paid cash on a new SUV and lived within your means to do it, more power to you! As a commenter, though, there is no sense in drawing lines in the sand, where person X is "good" and person Y is "bad" according to our own thoughts of where money should go (I'm assuming within reason of course, that we are not spending money on vices, drugs, etc). What some may see as a frivolous item, another may depend on sales of that item! As long as we are living within our means and budgeting for our purchases, we should be free to purchase with a clear conscience. That roofer is surely thanking God for his timely provision and that you had the funds to pay for the job. Ugh! You can't do anything without somebody giving you their negative 2 cents' worth! I'm glad you got the new roof you needed and that you gave someone a job who was probably very thankful for the work. We need to do the same. So much needs doing around our home, but I'm afraid to let go of the money in case things get worse and we need it for food or some such (probably being a bit paranoid here, but I can't help it). It's hard to let go of that money when you're used to saving it. Feels nice to have it. But sometimes one must spend it. I'm sure it was very hard for you to let go of that money. But you can rest assured that your roof will keep you dry until the children are nearly grown (if you stay there that long), or it will certainly help with resale. It truly amazes me when you get criticism, Meredith. I can't think of anyone who is wiser with money than you are. I am glad so many people have already said what I would say, including why, why, why would someone feel entitled to criticize you in that way? Enjoy what you've worked hard for, enjoy your security, and enjoy helping another family -- or families -- stay employed. Criticizing you for a new roof?? Now that's just silly. Grow up, people. If you can't handle hearing about a new roof, read something else. I suppose we're completely insensitive too...we put cooling in our house so we could deal with the heat of our summers. The way I see it, we had the cash and had been saving up for three years to do it and we gave someone else a job to do. Yes, it was terribly wrong of you to provide employment to the roofers! Goodness...what are people thinking? Oh it's just plain silly! The only reason I can think of for the criticism is that you posted about the roof at a time when someone was feeling low about their own situation. And they've taken it out on you. I wanted to let you know that by spending money on your roof at this time, you are definately, in your own way, helping the economy and job security! We're in the UK and my husband Stephen is a plasterer and of course times are hard for the construction industry, but it's the small jobs here and there around peoples homes that are keeping our heads above water. So good for you being frugal so you are able to afford those home improvements and helping those families of the people who did your roof! I'm sorry that you were wrongly criticized for getting a new roof. I have seen MANY out of work construction workers bringing flyers around my neighborhood so that they can find jobs to provide for their families. And I am afraid that recession or not, my roof might need to be replaced soon. And it's a matter where if you don't replace it, you could really damage the rest of your house. Its hard to believe you were criticized! Your post actually inspired me to go ahead and call our insurance agent to have our roof looked at. It was damaged in a recent hailstorm, but we didn't really know what to look for in terms of damage. I am grateful for your original post. If it hadn't inspired me to call and we had waited too long, then we would have had to pay for all of it ourselves instead of being able to file a claim. Wow... there are so many comments already here. We've had several home repairs made recently, by a friend who is handy around the house and had little work to do at his "real job". He earned extra money for his family, and we got a great deal on our long-postponed repairs. I think your new roof looks quite nice. If you need a roof get a roof and invite someone over to share dinner under your roof, and be glad to have good friends in your home under your roof. I popped over from Moms need to know just to say - I am GLAD you have a new roof. That's silly. Who cares how you spend your money! Some days I just don't get it. Do people think that because you choose to NOT spend money that you don't HAVE it - so it takes them off guard when you DO spend it? It seems to hit a hot button with THEM. Ya know? As hard as we can try to not trigger other people's hot buttons, it seems that the economy, especially in tough times like these, is ALWAYS going to be a hot button with SOMEone. Hang in there lady. You are doing a great service here. I am a mother of three small children and wife of a framing/roofing contractor. We live in Michigan, where times are especially hard for those in the trades. My husband is a very hard worker, and men like him are trying to provide for their families too. I am shocked that anyone would be so judgmental as to suggest that you made a bad decision. Roofers have families too! :-) I'm glad that some people like you have carefully managed their money so as to have enough for needed repairs, even when the economy is tight. I had to go to comment moderation because of ugly comments. It is beyond me why people make such comments. I've been writing on my blog about preparing for difficult times. We went through two different job losses where my hubby was out of work for over a year each time. One thing I've advised is to get all home improvement projects finished NOW. Should you sell your home, you don't want to have to do them because the seller's home inspector finds a problem. The new roof looks great! It is practical and if you have the money and need the repair, that is smart. I have been dreaming of remodeling, but we do not have the cash, so it will wait. I think now is a great time too, especially if inflation is coming around the corner and materials and energy costs rise. There are always going to be people who try to make you responsible for the way they choose to feel. I missed the original post, but as the wife of someone in the construction industry, thank you for choosing to replace your roof now! Envy and hurt are the only reasons I can think of why someone would be upset over a new roof. But I don't begrudge you that, and I don't begrudge the wealthy homeowner who is building a luxurious two story home with an indoor theater, and employing my husband to do some of the work. If we didn't have people with the money to spend on that kind of thing, we wouldn't have money to spend on groceries! Cheerful frugality is what I love about your blog, Meredith, and why I keep reading. Keep it up and please don't be discouraged by the occasional grumpy commenter! This isn't a popular view but it sounds to me like the person that make the comment is really suffering. When you are truly facing financial collapse, I imagine that some of the fluff would get to you. It's like when I had a preemie over the summer. The LAST thing I could tolerate was someone complaining about their pregnancy. It just seemed so offensive to me. I tried hard to not take it out on anyone but I can understand the frustration. Let's all keep in mind that being frugal isn't a game to a lot of people out there. Even though I hear lots of self righteous comments, we should all remember that even if we do everything right we aren't immune to bad things happening that may be out of our control. I don't know what to think about this post...it doesn't seem right to incite over 100 "supportive" comments for one negative--and the assumptions that the majority of these commenters make are ridiculous. Maybe I am sensitive because this is exactly what happened to me in your comments section once--about RICE, of all things. What I'm getting from your post is that if you need something, have the money then spend it. For instance, we need to purchase digital TVs so we'll be buying them before July. I do have to say I don't get it that someone would have issues with you for getting a new roof. That's a necessity! Besides, who cares. It's your money!